I'd like to remove the top of my console so I have a bit of a winter electrical project, got a few items to install in the console and would like to have a general tidy up. 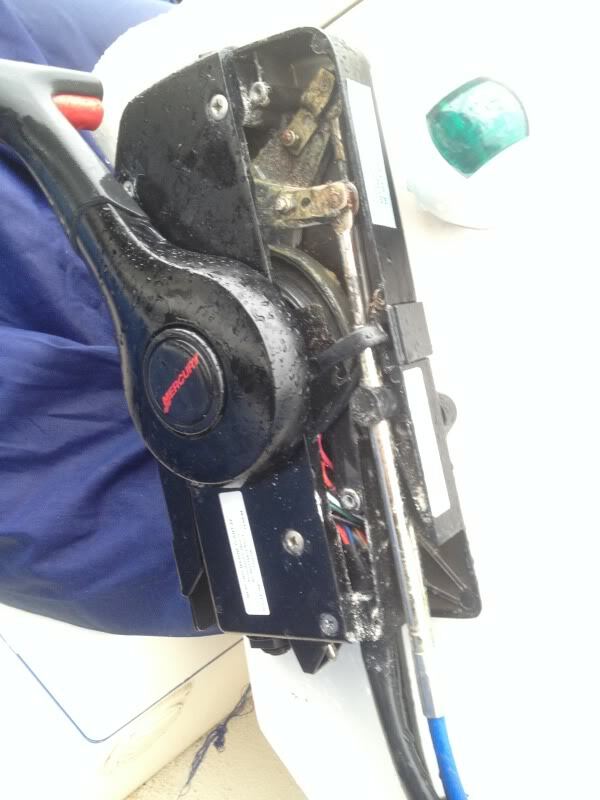 Not ever fiddling with boats before I find myself stuck trying to remove what I assume to be the throttle and transmission cables from the control unit. Without wanting to disassemble the whole thing and get faced with a load of comedy springs flying out at me I'm presuming this is a straight foward thing to do? See photos! Can anyone offer me any advice? (before I hack the console and remove the thing complete! I'm also presuming the wiring loom will have a plug coupler in there? If you remove the bottom section of the throttle control box you'll be able to access the gear and throttle cable. Use a decent philips screwdriver or you'll strip the head of the screws. I prefer to use an interchangeable bit on a power driver. Lean in to it and it will unscrew. Those stainless steel screws rarely seize. There may be circlips holding the cable ends in position. Once they're off the 33c cable can be removed. 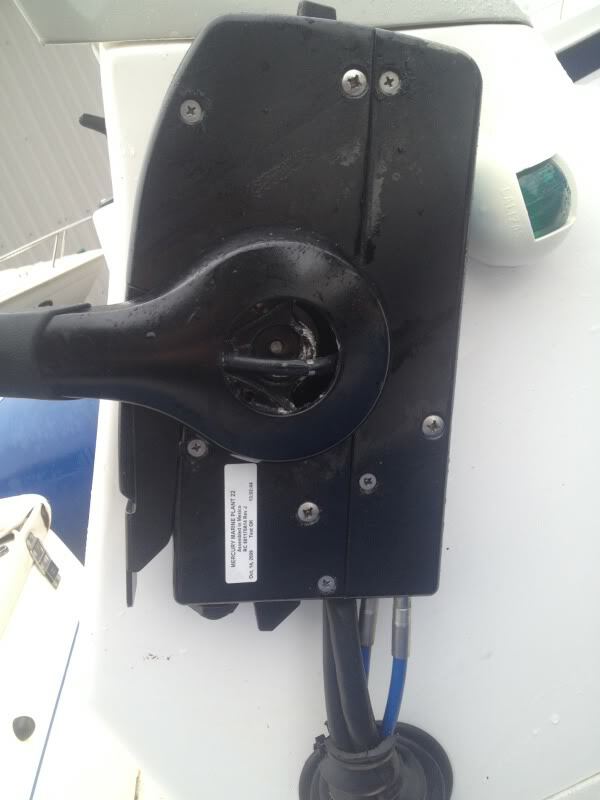 Use a little marine grease to lubricate the cable ends and box internals when refitting. Regards the wiring loom, I suspect it's bullet connectors with rubber sleeves. Although colour coded, mark the red wires as there are usually a few, feeding power trim, etc. Great thanks, I presume its the two smaller screws on the bottom and the larger cross head (fixing the unit to the console) ? Yes that's right take the two smaller screws out and the single bigger one fixing it to the console. I've had to drill the heads off the crews before to get the cover off and use vice grips to get the screws out and replacing them. They are bad for seizing in. No need to drill em out... (they're stainless steel 316). If the bit doesn't fit the head, stop. Get the right attachment. Trust me, with the right phillips head the screw will come out just dandy! the hard part is getting the screws out of the cover, once that is of I would sugest before dis- assembly that you mark one cable(paint tape etc) and photogragh it so that you have a reference for when you put it together.You will need to remove the control box handle a 13mm socket is required, and the control cables a 8 mm socket or spanner, a socket is easier. Not true - had to drill two out recently (one of which I'd only unscrewed a couple of weeks before!) - the trouble is they are screwing into aluminium. Give the screws a liberal coating of grease before replacing! Yes, you only need to take the smaller plate off to release the throttle & gear cables. If you take the bigger plate off you need to be very careful you don't damage the small microswitch for the neutral detent (Suzuki control box anyway) & some semi spring-loaded bits - but this should not be necessary or advised. Well a bit of progress! Thanks for all the advice. I did indeed have to drill one of the screws out, it had indeed seized solid from the corrosion of the alloy. Even struggled to get the remainder out with some mole grips. I can't get to the wiring to expose the connectors on the multi core cable to the engine as someone has mentioned above the lever needs to come off. I'm tempted to cut it in the console and fit a decent quality sure seal connector or similar. Am I correct in presuming that if I take the assembly off the console the handle is bolted in from the back side? 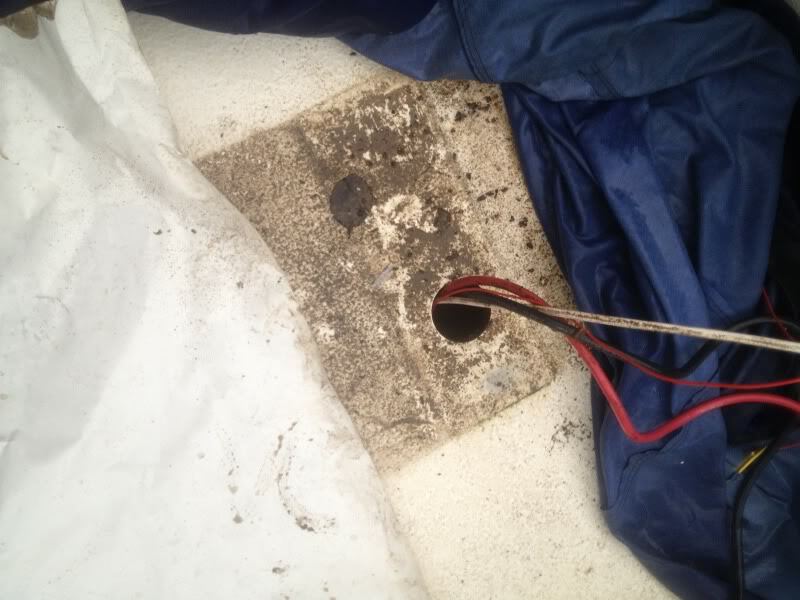 I've also found one if not the reason why the hull is filling with water when it rains! Found this unsealed hole under the seat. Unbelievable. Beaching the boat a couple of times every summer to drain the water out is not an option any more. didn't take much investigation to find out why this may have been happening. Why the previous owner didn't look into this is beyond me.